When Mark was stationed in Norfolk Va at the beginning of our marriage, we tried to see a good part of the area, but we stayed on the other side of the tunnel in the Norfolk, Virginia Beach, and Chesapeake area. We didn’t fully take advantage of being near the Historic Triangle as I now wish we had. So we had to make a stop there again and take everything including these 11 free things to do in Williamsburg VA.
Jamestown Ferry – This ferry ride lasts about 15 minutes, and it’s free! It’s a great way to see the land like the early settlers would and if you are lucky some great sea life! Take a Scenic Drive – The Colonial Parkway connects Williamsburg, Yorktown, and Jamestown and runs about 23 miles. There are Interpretative pull-offs along the way plus you can take in the York and James Rivers. Go for a Hike – Take a hike along the Greensprings Greenway Interpretive Trail. This hike is about 3 miles long with a boardwalk over the wetlands and lots of interesting trails signs along the way. Freedom Park – This 689-acre park is a great place to spend the day! While it holds the typical hiking biking etc. This park also has an 18th-century graveyard, the Williamsburg Botanical Garden and one of the nation’s earliest free black settlements! Lots to see and do! U.S. Army Transportation Museum – This museum is located on Ft. Eustis and is 6 acres to explore of the history of US Army transportation. 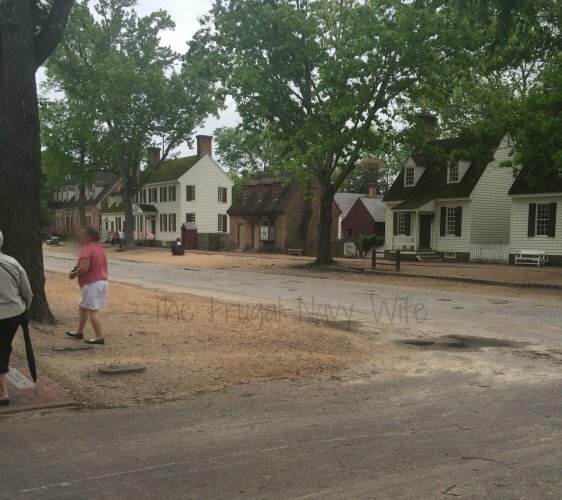 Tour Colonial Williamsburg – You can walk the streets and witness some of the demonstrations without buying a ticket. But to go inside the buildings you will need the tour tickets. Stroll the Yorktown Waterfront – Head to downtown Yorktown and talk a walk along the Riverwalk Landing. This is a mile long riverwalk along the York River which makes a great people watching area! Historic Triangle Shuttle – This shuttle runs from the Colonial Williamsburg Visitor Center to and from the Yorktown and Jamestown areas. Outdoor Movies – Head to the Riverwalk Landing for some great outdoor movies. Bring a blanket and get comfy! The Casemate Museum – Located on Ft Monroe the self-guided tours of the Casemate Museum are free. The museum boasts features such as the room where Jefferson Davis was held as a prisoner following the American Civil War, Major General Benjamin Butler’s Contraband of War decision that granted refuge to 3 escaped slaves, and tells the history of the US Army Coast Artillery Corps. Free Summer Concerts – If you are military make sure to take advantage of the free summer concerts that take place all over Hampton Roads area. Check out the MWR website to see the current concerts. Did I miss any freebies in the Williamsburg / Historic Triangle area? 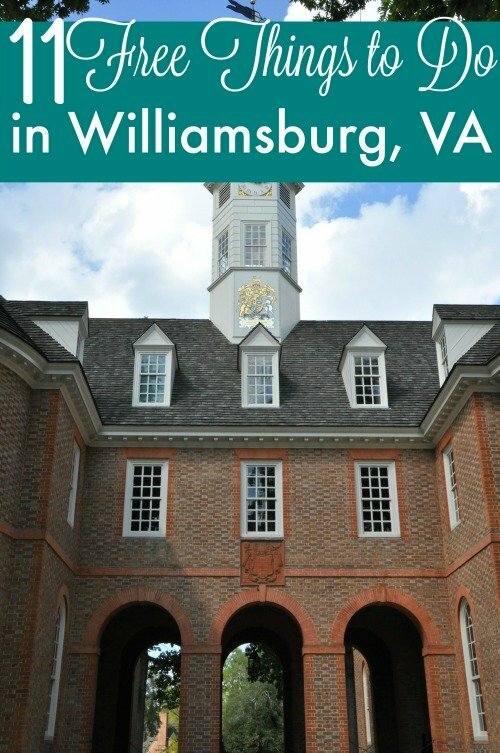 Let me know in the comments below and ill add them to the free things to do in Williamsburg VA list. There are a few great books I recommend for kids to get them prepared for visiting Williamsburg. Great tips! We are here in Williamsburg currently. Thank you:).